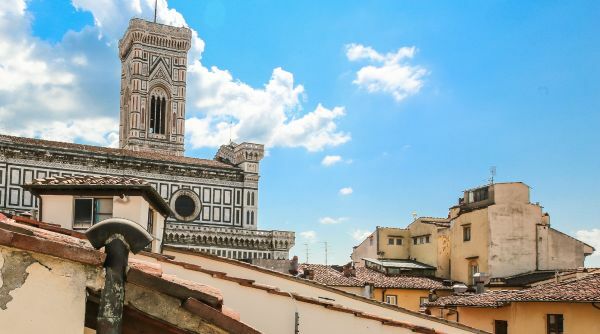 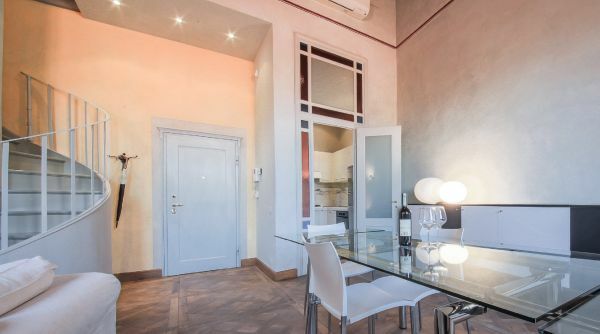 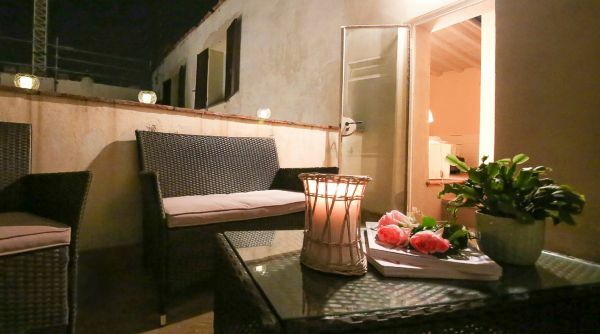 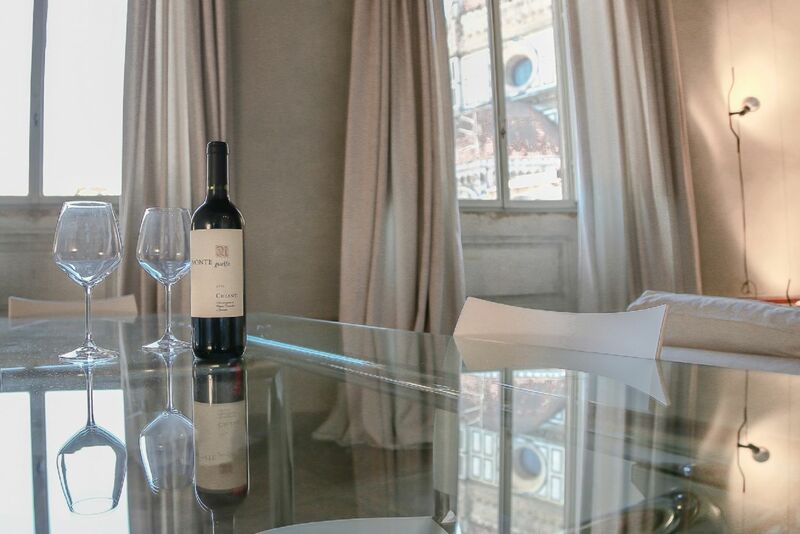 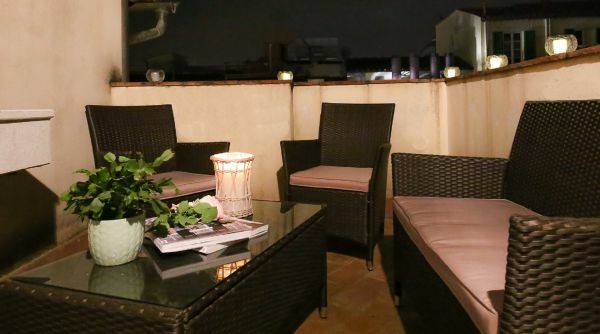 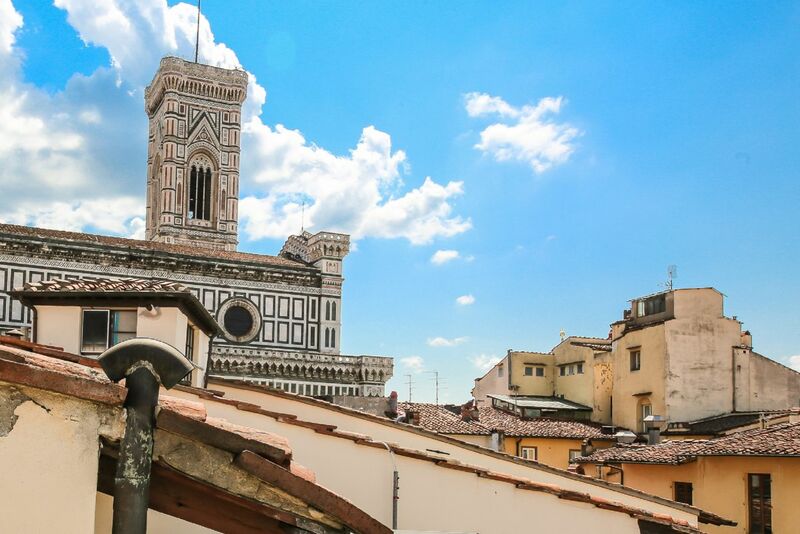 A prime choice location just minutes away from the Duomo, with outdoor terrace overlooking Florence's rooftops. 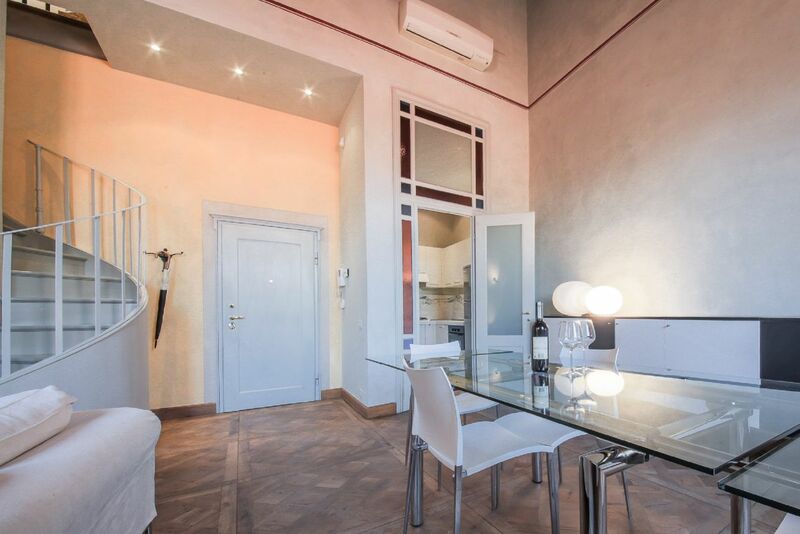 This apartment is located on the fourth floor with elevator – very rare feature in downtown Florence! 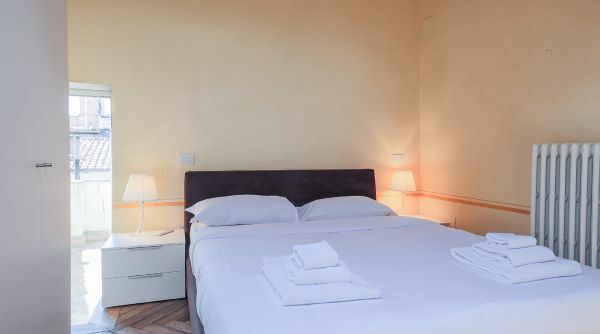 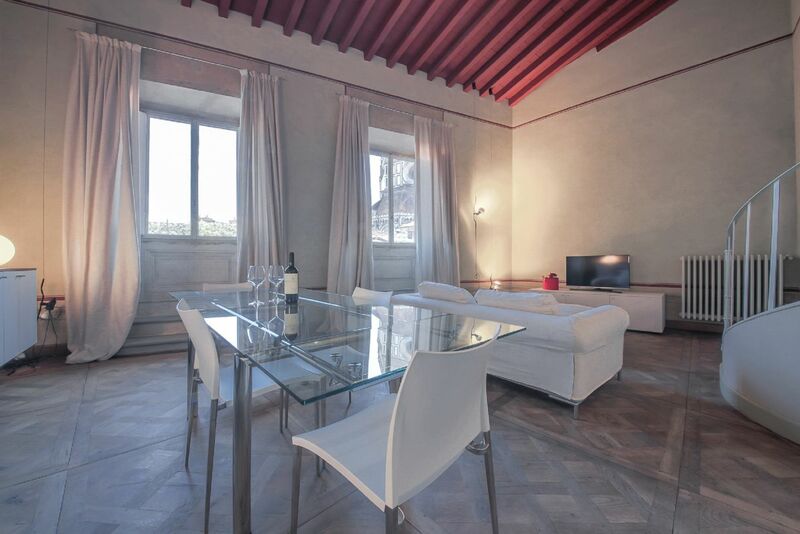 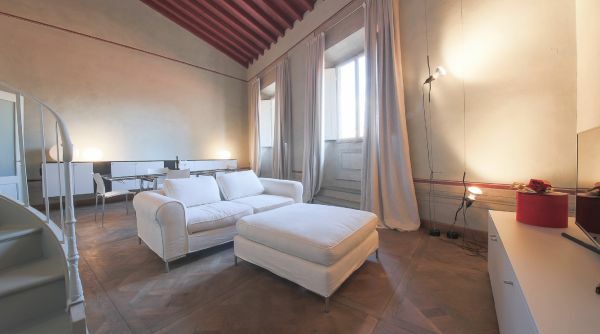 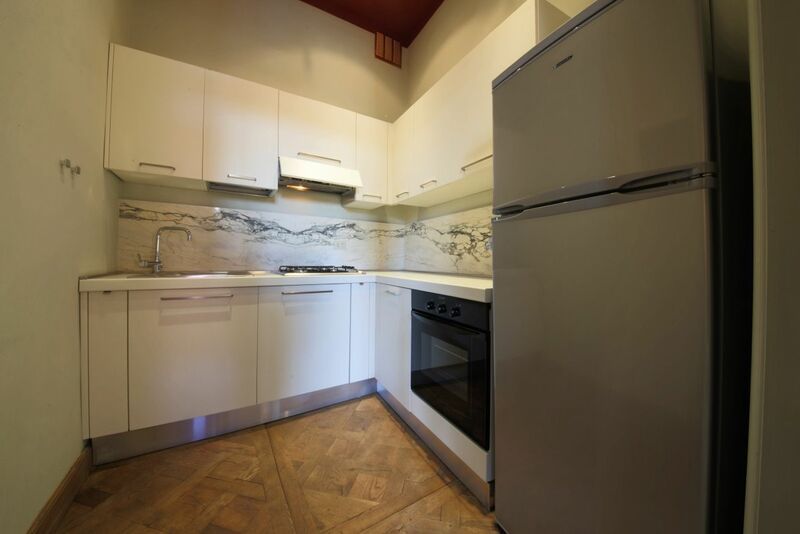 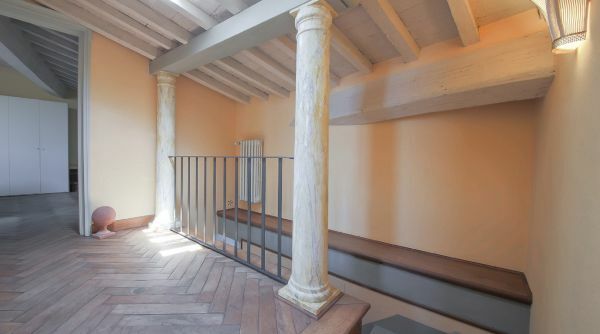 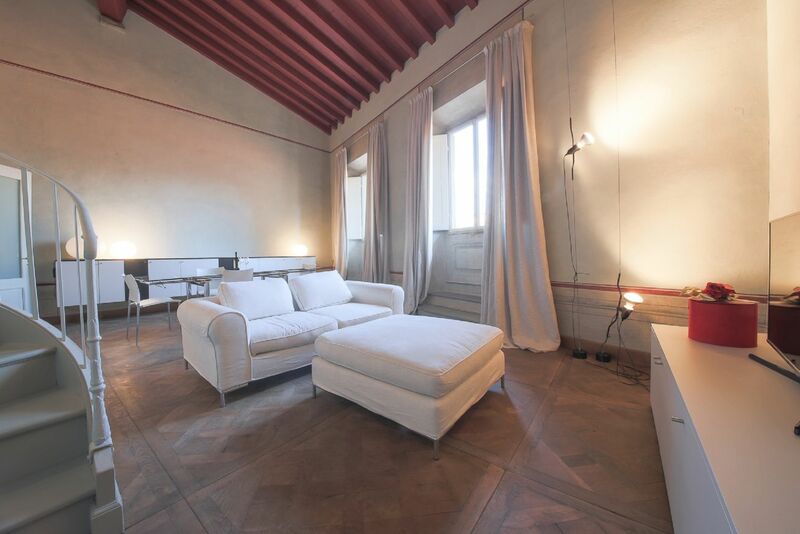 - of an historic building on Via Ricasoli, famous street in very heart of Florence, just minutes away from Piazza Duomo. 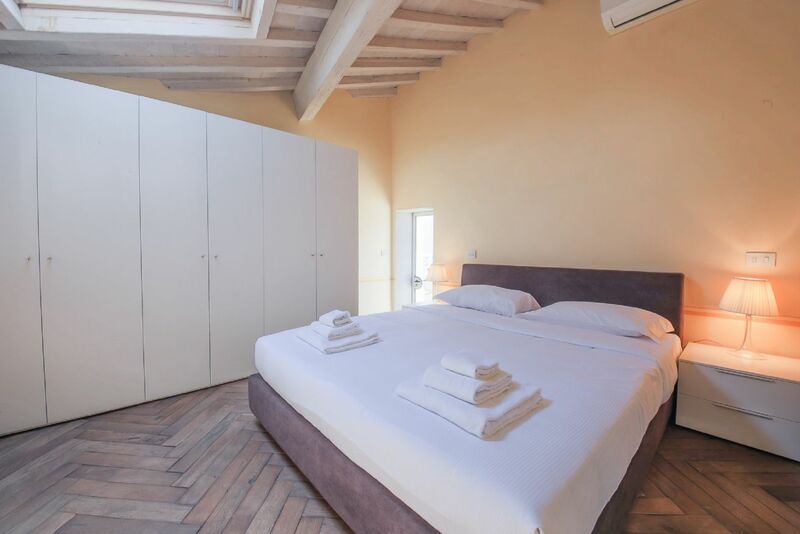 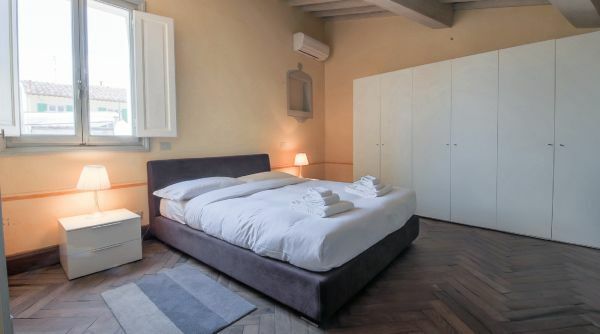 The whole place has been recently renovated and redecorated with great taste, chic style and special attention in the traditional features of the original Florentine homes, such as the exposed wooden beams, the finely decorated hand painted walls and the stone niches and details in the rooms. 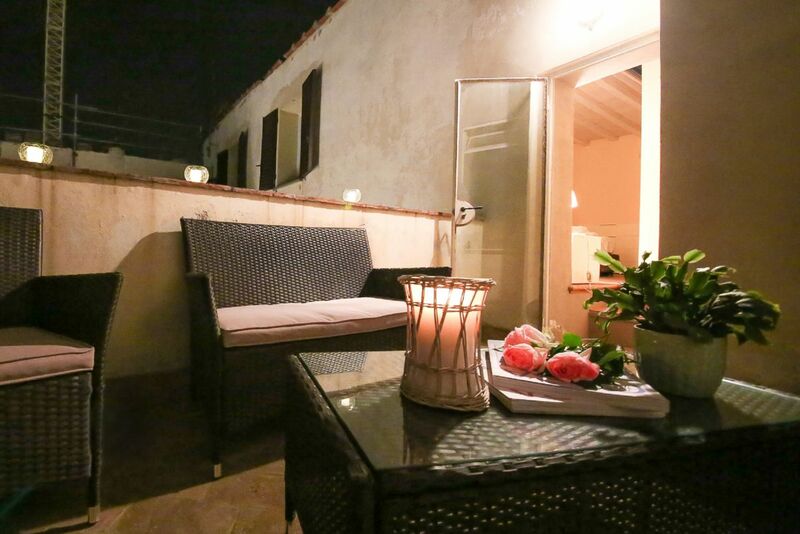 The apartment is set on two levels. 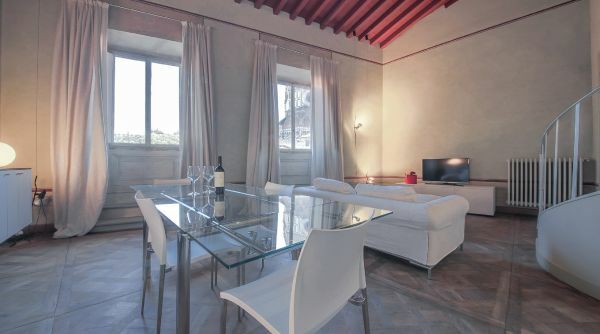 On the ground floor you'll find the spacious and bright living area, with parquet floors, equipped with a comfortable sofa and a glass dining table. 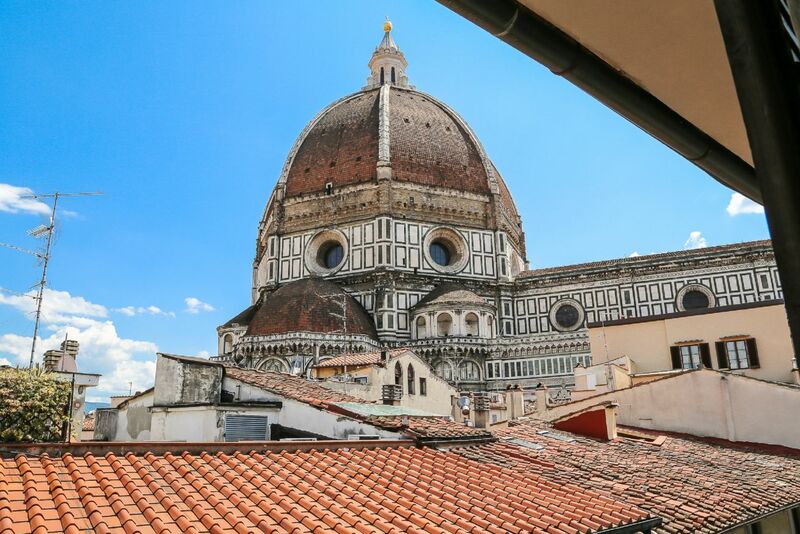 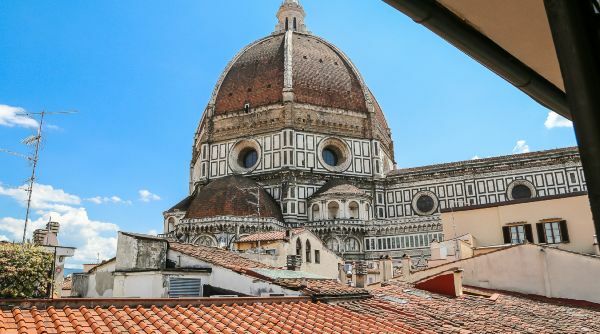 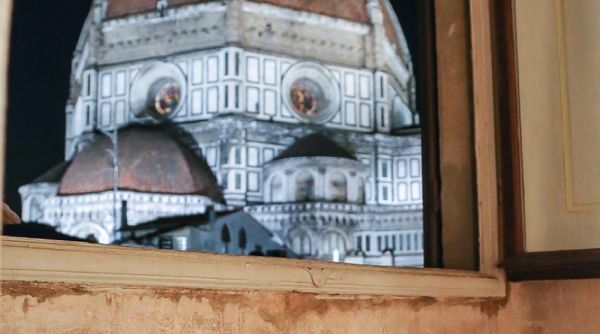 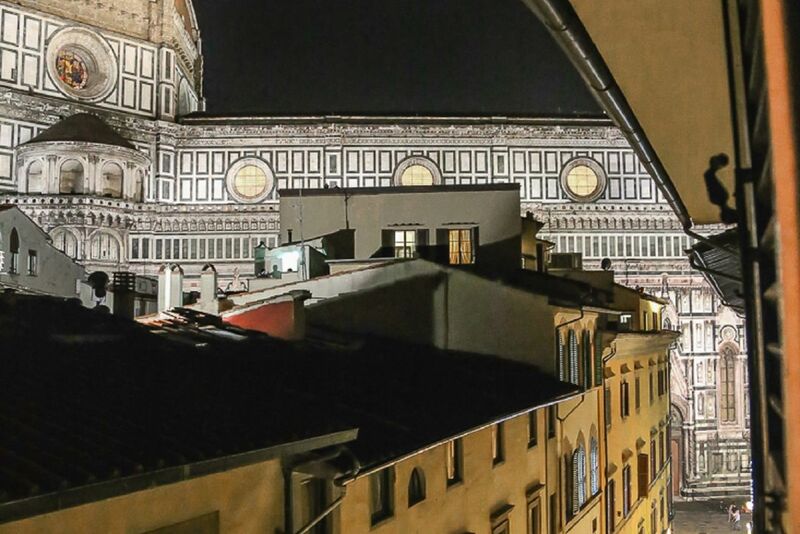 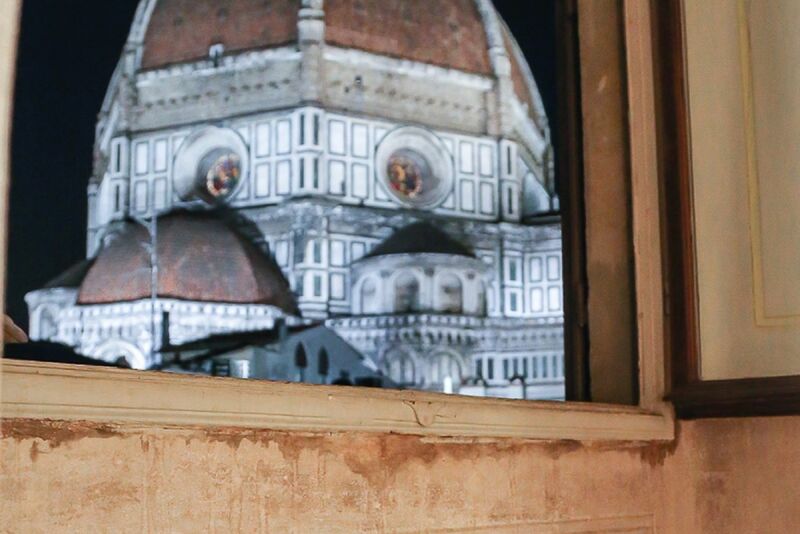 From the living room’s window a stunning view of the Duomo will surely enchant you! 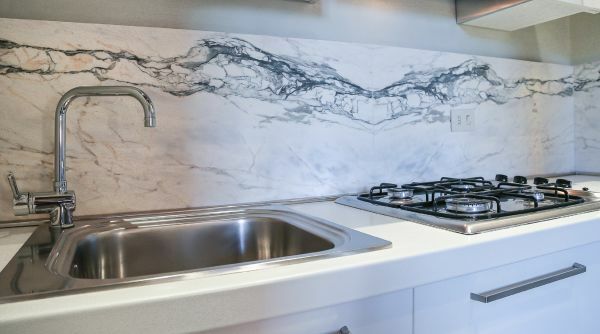 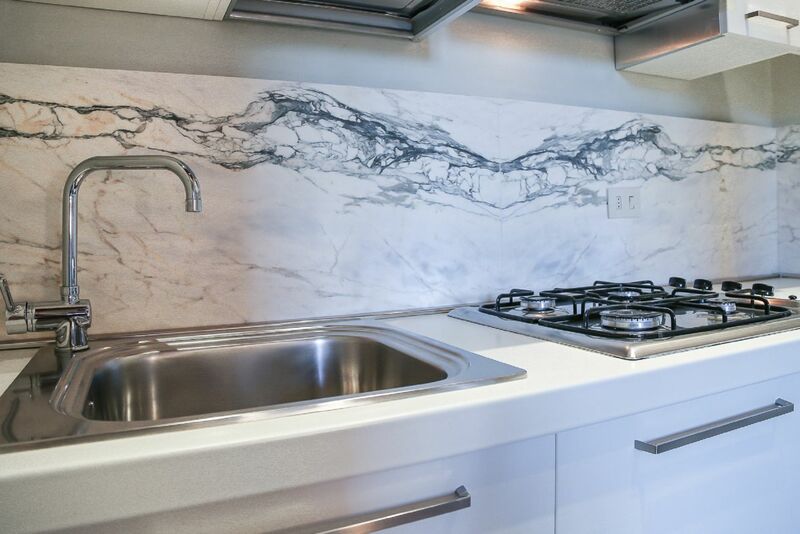 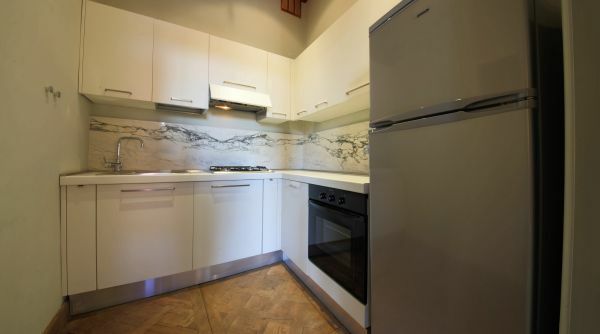 The small kitchen is modern, featuring marble panels and equipped with everything you may need to cook your own meals at home. 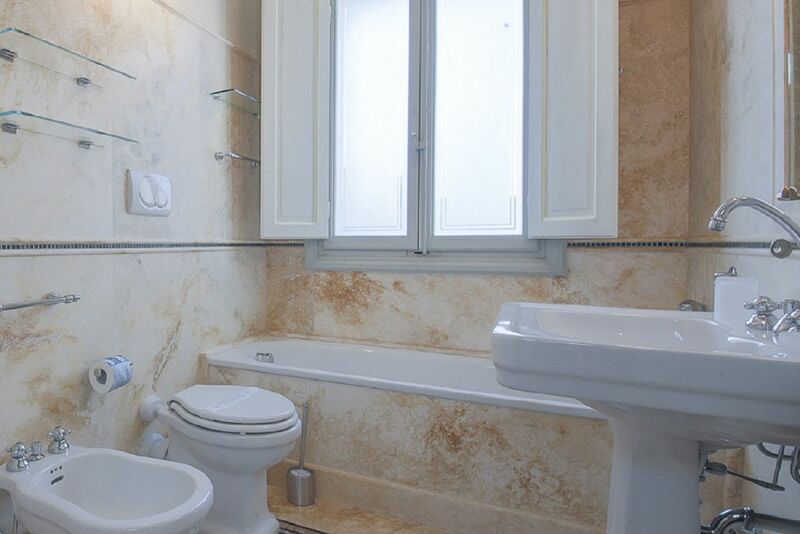 Last but not least, on the ground floor you'll also find a newly redone bathroom. 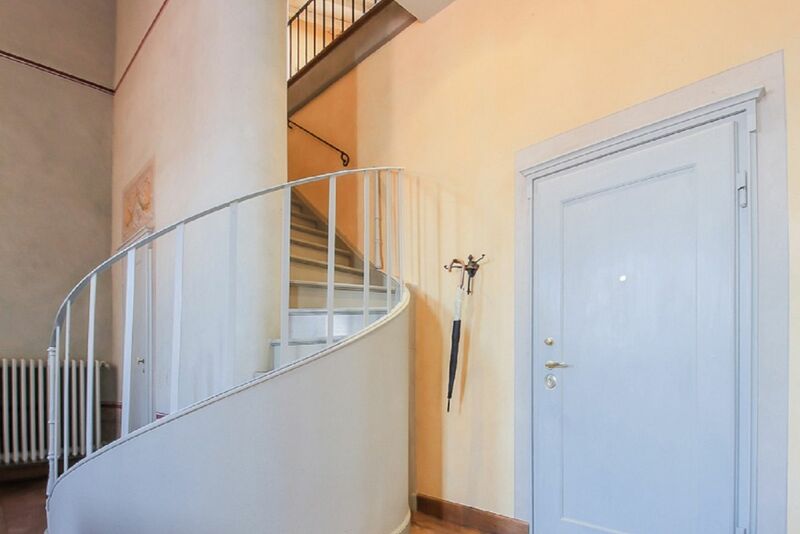 An elegant staircase leads to the first floor where the two bedrooms are set. 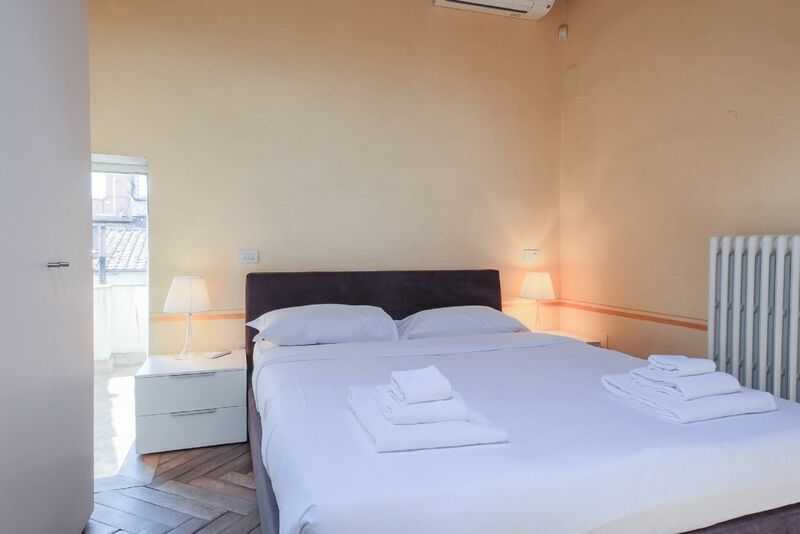 Both very romantic and classy, the bedrooms are equipped with large closets, night tables and queen size beds. 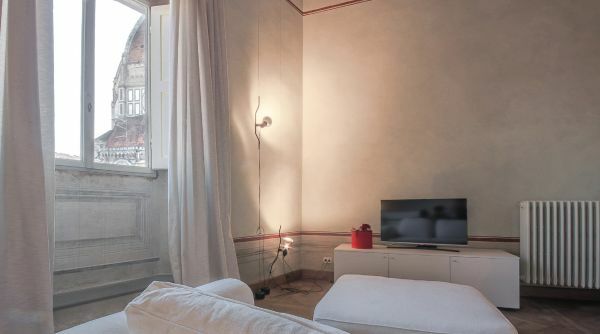 One bedroom is in fact a real suite, thanks to the presence of its private bathroom. 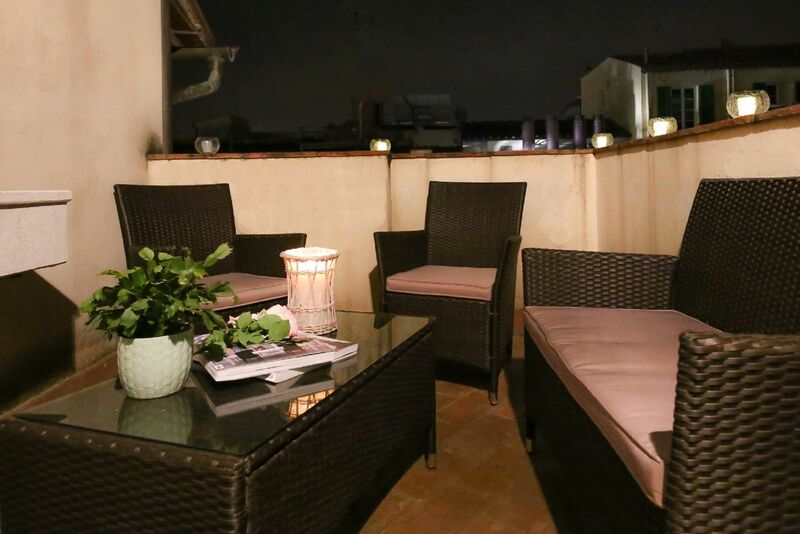 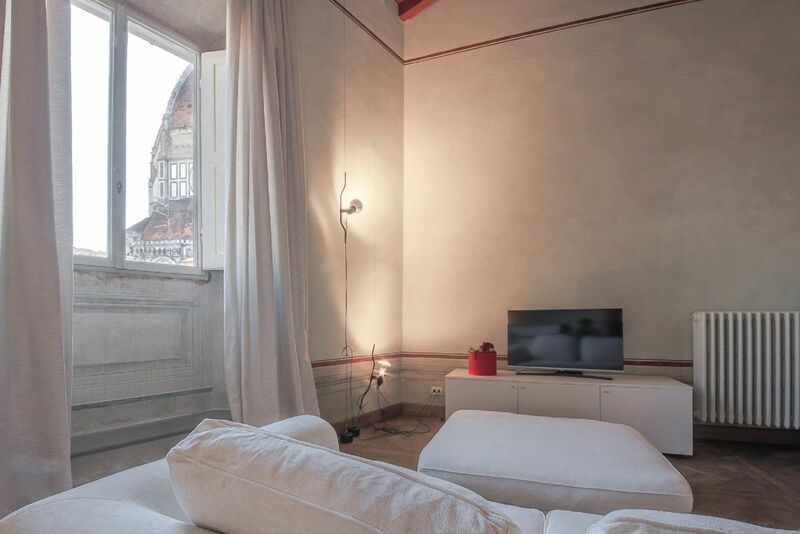 From one of the bedrooms you'll also have access to the outdoor terrace, with a nice view over Florence's rooftops. 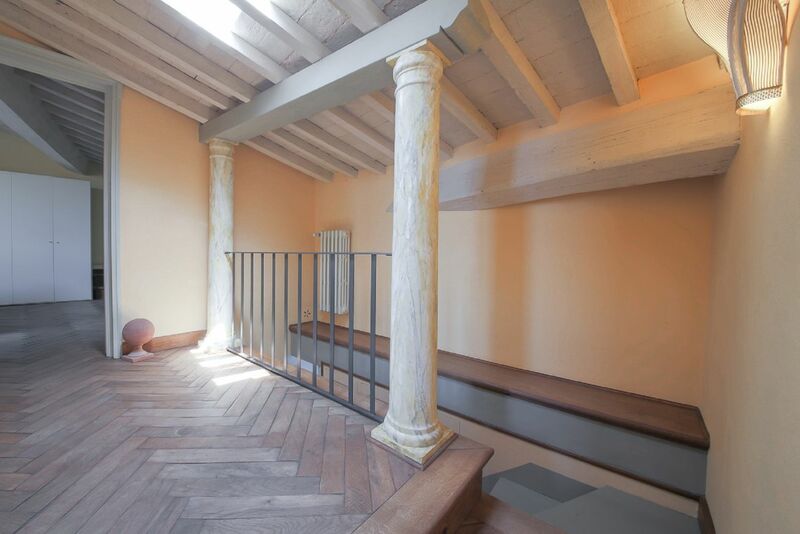 A third bathroom can be found in the upstairs corridor. 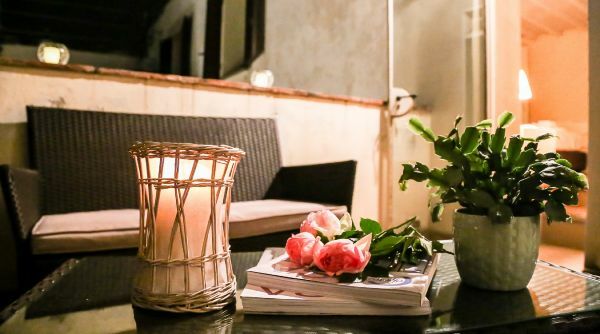 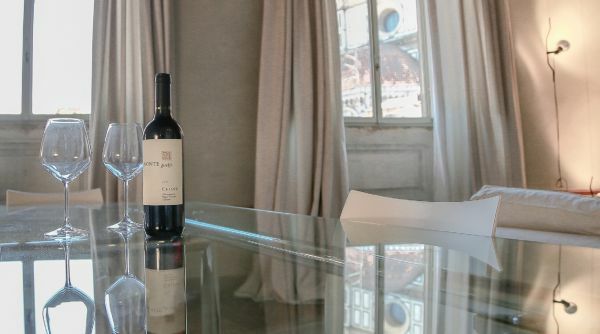 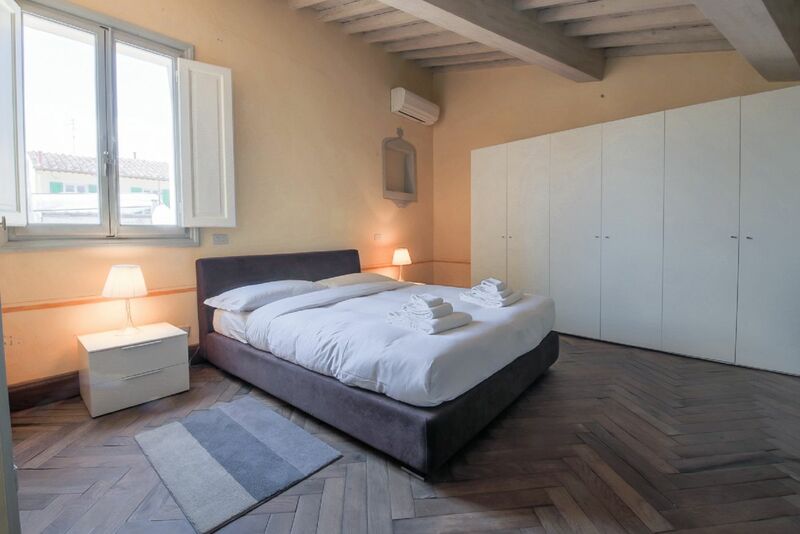 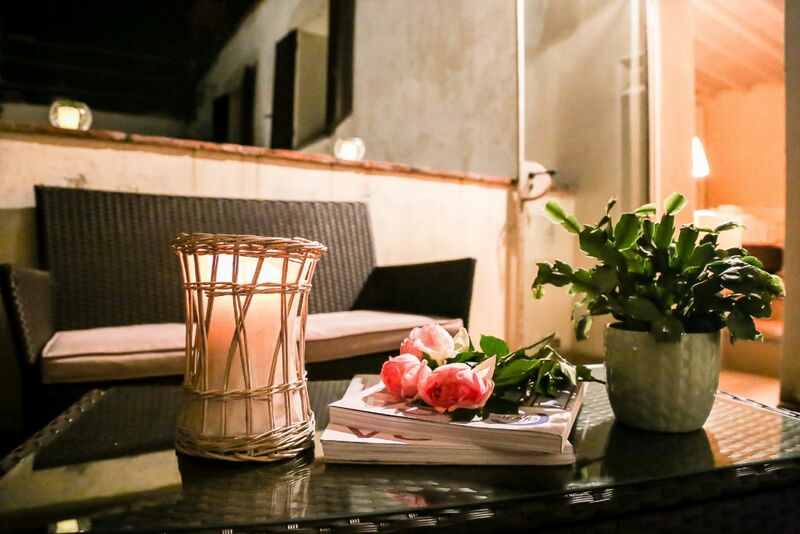 This stunning apartment is the ideal choice for a couple, a family or a group of friends looking for an elegant, cozy and comfortable apartment in the heart of Florence. 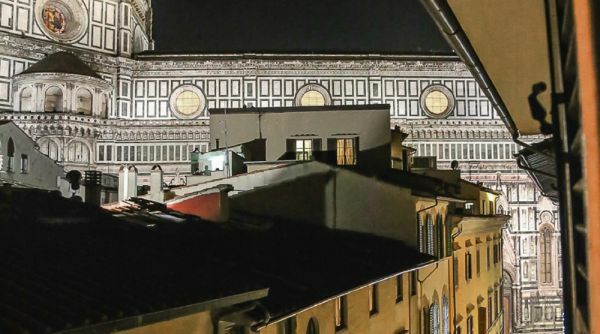 From the apartment the Duomo is literally two steps away, while all the other attractions, such as Ponte Vecchio, the Galleria dell'Accademia, the Uffizi, Palazzo Vecchio, Santa Croce are just a short walk away; a pleasant stroll through Florence's historical neighborhoods, filled with restaurants, cafès, workshops, markets and anything you may wish for during your Florentine stay. 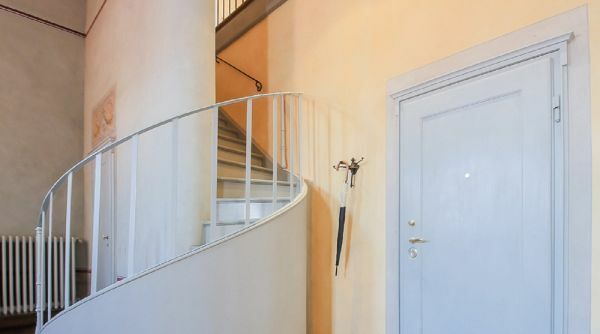 •	Fourth floor with elevator – very rare feature!